Hi there! Hope you're doing well on this *sigh* Monday morning. Today's card is a little different for me, huh? It was created late one night when I was really tired but couldn't sleep because I made the mistake of having caffeinated diet soda at dinner. Don't 'cha just hate when that happens? Your body is begging for sleep but your eyes say 'no way'! So I started playing games by challenging myself to use certain supplies and/or try different styles. This was one of the cards that happened that night. Thanks so much for stopping by! Hi there! It's Wednesday - whoo hoo! Do you live for the weekends like I do? Anyhow, this card is for my friends - all of them. I think I'm up to ten now. Kidding :) I've been a little wrapped up in my own insignificant dramas lately and haven't been a very good friend to anyone else. But oh how my friends have been wonderful to me!! Cards, emails, phone calls...all this as I feel like I've fallen off of the edge of the planet. So here's my pledge: I'll be returning phone calls, I'll be blurfing again, I'll get back to regularly checking my email and I'm going to finally mail out some of the cards I've set aside for each of you! Please know that I'm thinking of you and appreciate each and every kindness. So - thanks for stopping by! This card's for you!!! Hi there! What's going on with you? All is pretty quiet around here, now that the heater repairman has left. Oh yes...just a few days into October and I've already had that "hey, is it me or is it getting cold in here?" moment. So tonight's card is a little simple. To accentuate the lines in the leaves I added two embossed lines at the bottom (love my Scor Pal!). The blossom is made of two layers of Prima flowers and a clear button. That's it! Thanks so much for stopping by. Whew! Tonight's post title has nothing to do with the card and everything to do with my evening. �Hi everyone! �Hope you had a good Tuesday. �I was informed today at lunchtime that I'd be hosting a family dinner. �And while I was thrilled to do it and it was tons of fun, oh-my-in-the-name-of-all-that-is-holy I am just not used to having chaos reign while little ones run around my house! �I don't know how all of you moms do it on a daily basis. �I coped by ordering pizza for the meal and using many Swiffer cleaning products during the aftermath. �But I wouldn't trade that family time for anything. �The husband even came home early from work! �And as one of my sisters was leaving she asked if I had any thank you cards. �Ummm...gee. �Let me check. �*Snort* �So I loaded her up for a bit and now I'm replenishing my stock on hand. �This one is so simple but I'm really happy with the textures and colors. �The base is plain old PTI select white, but I took the BasicGrey two scoops patterned cardstock and ran it through my Big Kick with the swiss dot Cuttlebug embossing folder. �Then I scraped over the front with a sanding block to give it more of a distressed feel. �I sponged the edges of the slider tag, tied embroidery floss through the clear button and stitched the edges. �Done! �Thanks for stopping by - and thank you for all of your kind comments and emails lately. �Who knew there were so many Neil Diamond fans out there?!!? ETA:� Typepad seems to be having some issues tonight.� I think I've corrected all of the weird formatting issues.� Thanks for your patience! Hi there - whoo it's a little past my posting time! Please forgive me because I was *gasp, choke* doing housework. Don't be too envious, though, because earlier I was sooo enjoying changing the sheets and doing laundry that I burnt the husband's dinner (taco meat). You know me - I used the situation to my advantage. The argument: this is evidence that I can not both cook and clean. Do you think this will go over? Me neither. Anyway, I had a wonderful lunchtime surprise today. The office staff decided to celebrate my birthday today and surprised me with subs and a homemade cake and flowers. And a hilarious card that I had to keep covered in the envelope. So I whipped this up to send around tomorrow to thank them. They really made me feel special. The card is pretty basic and all of the elements are favorites you've seen me use before. I'll just point out that I propped up a portion of the sentiment on foam dimensionals. Thanks so much for stopping by. I truly enjoy hearing from you! Hello again! You know, I'm certainly very blessed with good friends and lots of family. And every year for my birthday they do spoil me with attention. And every year I LOVE IT! So in my last post I shared how I went on a luncheon excursion yesterday with Liz and Fran. Well, I followed that up with an outing with family for dinner. My sisters wanted to treat me to dinner at a local church carnival. It was so much fun! It couldn't have been any better. Both of my parents were there, as well as my sisters and their families. We ate funnel cakes and hot dogs, listened to music, played lots of games, won lots of prizes, ran into friends and even spent time talking to a local Greyhound rescue organization. (I'll talk more about that in a few days.) My husband had a blast walking around with Jack because Jack couldn't get enough of the sights and sounds. Those two kept wandering off together looking at mini-coasters and playing balloon popping games. They bonded so well that the husband was still talking about it tonight at dinner. And even though I asked my sisters that they not buy anything, apparently the four infants went shopping at Michaels. Imagine that!?! All by themselves they filled a gift bag with ribbons and Primas and a multi-tiered crystal pull chain. As I paused to admire the chain my sisters explained that was my 'challenge item'. Oh and a challenge it is! That one will require some thought. I had a blast this afternoon playing around with all of the goodies. One of the things I made was this set of cards. As I look at them now I can clearly see how my happiness is reflected in the colors. And I used my Fiskars threading water punch again! Definitely a new favorite. Tomorrow I'll share creations made with some of the other 'wilder' ribbons. Fun stuff! Thanks for stopping by! Hi there! I'm posting early...can you believe it? One of my friends had some fairly extensive dental work done the other day and I wanted her to know I was thinking of her. Out popped this card. I'd recently read about distressed dry embossing on Kurtis' blog and decided to give it a spin. The base of this card is SU confetti white and I added a layer of ruby red and some Chatterbox paper I had been hoarding. 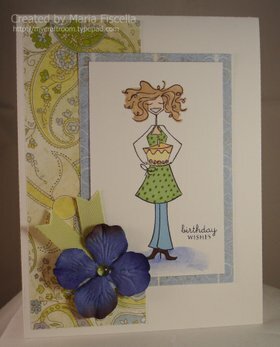 The Chatterbox paper was run through my Big Kick with the Cuttlebug swirls embossing folder. After it was embossed I gently rubbed over it with a sanding block just so it pulled out the design. And there you have it - distressed dry embossing. I used my sewing machine to stitch on the flower stems, a SU distressing tool to rough up the edges and my Cuttlebug tiny tag set to create the tag. The tag is PTI white that I sponged with river rock ink and then stamped the sentiment in basic black. Some frayed PTI ribbon, Prima blossoms and Foof-a-la buttons round out the cast of characters. Thanks for stopping by! Liz and I met in kindergarten and have been friends ever since. Almost *huge gasp* 30 years now. Friends like Liz come along once in a lifetime and I'm very happy to share that she's getting married tomorrow. Consequently, wedding thoughts have been swirling in my brain lately and this was one of the many cards produced that were 'wedding inspired'. The base and focal piece are Papertrey's aqua mist, and the cream layer is SU very vanilla. The flowers are Prima and I just wrapped them in taffeta ribbon to mimic a bridal bouquet. The ironic thing is that Liz isn't even doing a bouquet toss! I cut and embossed the focal layer with my small rectangle Nestabilities, embossed the vanilla layer with the swiss dot Cuttlebug folder, and added the sentiment from Papertrey's Sweet Love set. I'm off to the rehearsal now with fingers crossed that I don't get lost on the way there. Thanks so much for visiting! Lovely card! I want that Swiss dot Cuttlebug folder too!! Thanks for the chance to win. Sandy - please email me your mailing address and I'll get the blog candy right out to you. To celebrate the awarding of the candy I thought I'd create a card that used some of the same items that were in the candy package. You know me...had to get the sewing machine involved. The details are pretty obvious so I won't go into too much detail. And Cole Hamels of the Phillies just pitched a 4 hit shutout vs the Braves. Wow. He's my favorite pitcher and do you want to know why? He just throws the ball once he gets it - no messing around. The ball game moves along at a great speed...the way I think it was meant to be. What fun it was to watch him tonight! Oops. This is a crafting blog - enough about sports for now! Thanks again for visiting. This card was inspired by many blogs that I've visited lately. I'm too embarrassed to tell you how many I peruse daily (I sorely need to update my blog list for you) but let's just say that I surf enough to be able to spot some emerging trends. I definitely see a growing trend towards what I'll call 'free stitching'...stitching not confined to edges. So I thought I'd try it. The base is SU kraft stock, I stitched using my Sew Mini, the blossoms are Prima, the centers are Bella's baubles, the ribbon and sentiment are Papertrey (Simple Little Shapes) and the ink is Staz On black. Thanks for stopping by! Today's card was inspired by one of 'my' students. Every year there are one or two that just leave a mark on my heart. The card base is a 4.25" square of Papertrey white. 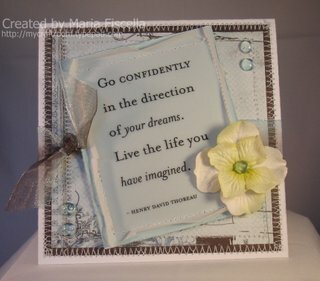 The sentiment is from an old DCWV vellum quote book and I layered it onto a piece of soft sky cardstock. I used my sewing machine and stitched the two together, then distressed the edges of both. The patterned papers are from Basic Grey's Periphery collection, the dew drops are from Robin's Nest's water collection and the flowers are by Prima. Check out the luscious ribbon! I love this ribbon and it's by May Arts. My Sew Mini is defective - the tension isn't ever right. I have decades of experience with "real" sewing machines so I'm aware I should have sent this mini back. However, I kind of like the randomness of the stitches and I'd never be able to achieve this on purpose. And so the defective mini stays. and spring moss twill ribbon for 'leaves'. The second card has the twill leaves but I used a Robin's Nest dew drop for the center. I used my Sakura stardust glitter pen to accent the ribbon on the gift and the cake plate and candle. The sentiments are both from Papertrey's Mixed Messages set. I think I use that set almost every day - I highly recommend adding it to your collection if you haven't already. And so I wish you best wishes for a great week. Thanks for stopping by. I sat down at my craft table after work today and just stared at my supplies. No ideas. I think three songs played on the radio while I just sat there. And then I noticed the little 'leftover' pile of primas I have going on in one of my baskets. I kept meaning to sort those and put them away properly! But I'm glad I didn't because it led to this. The card base is cool caribbean, and the layers are PTI white and spring moss. 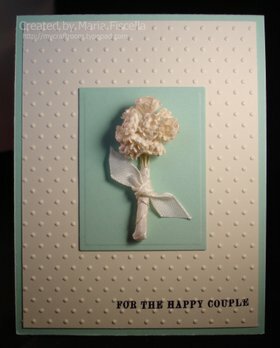 I embossed the white layer with Cuttlebug's swiss dots folder (love that folder!) and stamped on the leaves and stems in spring moss. The stems are from the original PTI set, Paper Tray, and the leaves came from Beautiful Blooms. Check out the butterfly - it's the tiny butterfly from Butterfly Kisses, and I used tempting turquoise ink on it. I wrapped the bottom of the main layers in spring moss grosgrain, and used Mixed Messages for the sentiment. 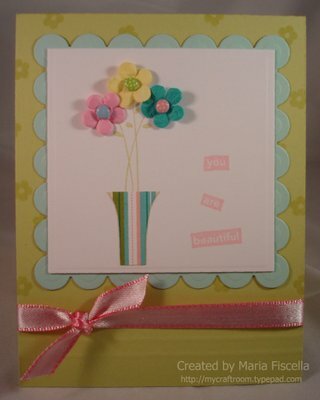 And yes, that's my current fave, diamond Stickles, on each flower center and the butterfly. I hope this card makes you smile. I've set a goal/personal challenge: for every new product I use, I want to also use something that I've been hoarding or ignoring. And that's how this card came to be. It's not a perfect card - in hindsight the design is too top-heavy. Live and learn and let it go, right? It's my first time using the square Nestabilities, so that's my 'new' in the design. It's also the first time I used my bone folder to create scoring lines as an accent. Maybe I should break down and get a ScorPal - I used the cutting groove on my CM paper cutter and I kept getting grid marks embossed into the cardstock. But it could just be a technique problem. Suggestions? The 'old' involves primarily the accessories and stamps used. 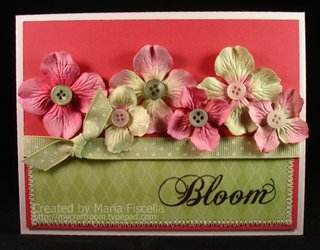 I started with a base of spring moss and used the tone-on-tone technique and the tiny flower from Little Lady to pattern the top portion of the card. I dusted off Vases in Vogue and Expressive Flexible Phrases to create the focal piece and sentiment (I paper pieced the vase using some retired SU paper). The best part of my new goal was that I dug out some Queen and Co. brads and used them to give the blossoms some zip. If it weren't for those happy blossoms I wouldn't be sharing this card! Enjoy the rest of your Saturday - I'm going to go open the windows and let some fresh air blow through the house. That'll put me one step closer to spring cleaning...maybe. Hello again! I'm so excited you've come to visit. Today was another great day - Regan D'Agostino , a fellow PTI addict and a writer for Inspirational, a blog that features unique crafts, emailed to ask permission to feature my PTI blog hop entry on their site. Of course I said (screamed?) yes. Yes! Yes! Yes! So that's been p-r-e-t-t-y cool. I'd not seen Inspirational's site before, but now I'm completely hooked. There's everything on there...great scrapbooking layouts, unique cards, unusual 'ingredients'...it's a fabulous place to go for inspiration as well as to find other crafters out there. And guess what? My card is right below one from Melissa Bickford! 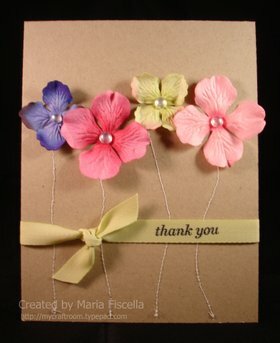 As in the Melissa Bickford from Papertrey whose blog I visit every day! I got so excited that I actually have a headache. Now on to today's card! My inspiration came when my newest Papertrey order arrived today. Ummm, yes, I do tend to spend a large portion of my crafting budget there, don't I? Well on my latest order was a jar of celadon Prima deux blossoms. I figured that since they're green they could be 'leaves' too. And hence the wreath. 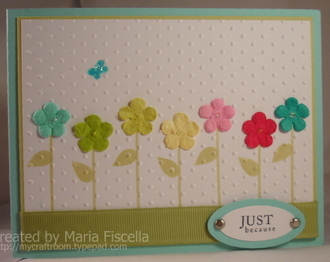 I started with a card base of Papertrey's white, then layered on some spring moss and a layer of aqua mist that I ran through my Big Kick with my swiss dots Cuttlebug folder. I'm still trying to dig out supplies that I've unnecessarily hoarded, thus the cute pearl beads that I bought from Ellen Hutson. I wrapped the aqua layer in sweet blush satin ribbon and attached my sentiment tag. I dug that tag out of an old box, too...it's from way back in the day before I started using die-cut machines. It was perforated so I sanded off the perforation bumps and used linen thread to attach it to the ribbon. I hope you like the card as much as I do. Phew. A long post for a great day!